We try hard to have a supportive environment where quality matters and we have fun along the way. We are proud of the work we do and of our fantastic employees. If you agree, a good Facebook review helps us recruit more Home Health Aides, Homemakers, and elder companions. Reviewing us on Facebook is easy! First go to the Facebook page of the office where you work. 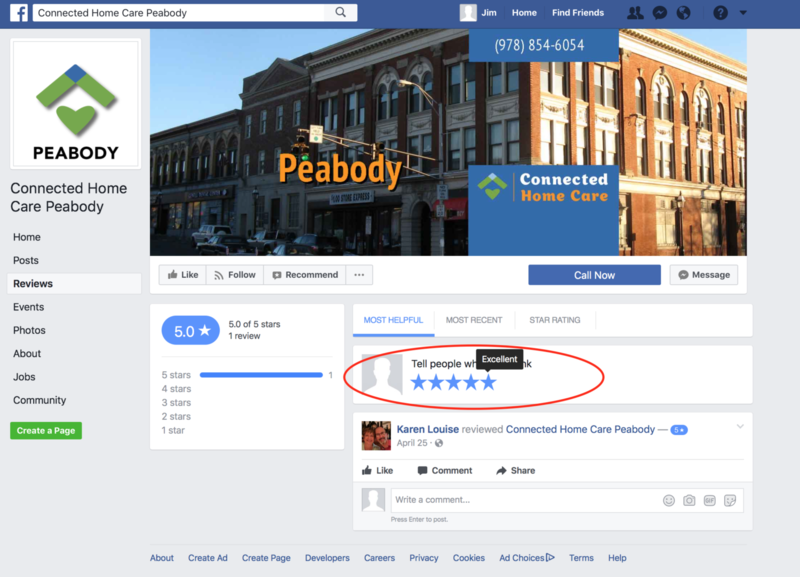 Let's say you work in Peabody - Go to Facebook.com and type in "Connected Home Care Peabody." On the Connected Office's Facebook page, you'll see a link on the left for Reviews. Click "Reviews." On the Review tab, you can select the number of stars to award us. We hope you'll pick 5! Then you will see a text box where you can enter a line or two about your positive experience working here. Supportive managers? Flexible schedules? Work near home? People treat you well? Whatever it's like for you. Thank you! We are proud of you, and hope you are proud to work here. If you have concerns, call your manager. If you are happy, tell your friends!